Optimised for distance for advanced golfers who own a medium to high swing speed. 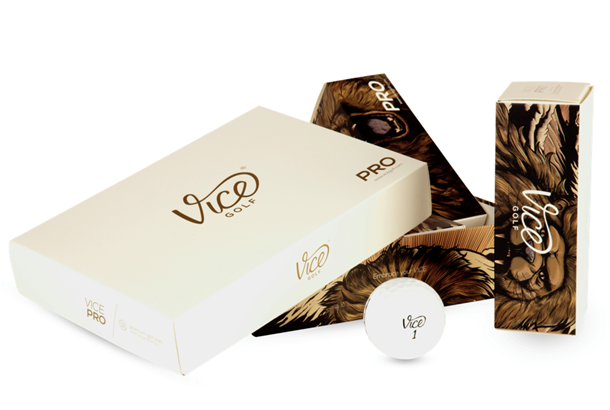 Vice says it offers excellent green-grabbing control thanks to its S2TG tech cover, which includes urethane just like a premium tour ball. What a revelation! We had no idea it was possible to create a ball for £29.98 a dozen that for many golfers would be indistinguishable from a leading tour ball. Our test pro loved the soft, sticky cover, and he said all-round feel and feedback with driver, iron and wedge was just like a tour ball. Wedge spin was within 500rpm of the highest on test, driver carry distance was just four yards back from the longest and ball speed was within 1mph of the quickest. And the Pro launched and flew higher than any ball on test. Seriously good. Vice is an interesting model. Its golf balls are only available online, not in pro shops, which seriously reduces the price of the balls. If your ball of choice is currently a premium-priced tour favourite, we can only say the Vice Pro is every bit as comparable, for a lot less cash. Found a pro flamingo today on the 3rd. Played the rest of the round with it and found it as good if not better than ProV1. Still as good as new at the end. I have been playing ProV's the last year or so and found these balls as good. With the price works out twice as good. Will be buying from now on :). Great feel, spin and distance, a little more durable than the ProV1. At under £2 a ball I don't think there is anything else on the market at this price which gives you that top quality feel. Bought them online, super fast shipping to the UK...just wanted to give them a try and was really surprised by its length and also perfect spin around the green...they are performing better than my old ProV1s and the price is incredible!